TO MAKE A DONATION TO THE CAPITAL GAZETTE, PLEASE GO HERE: The Capital Gazette Families Fund. Tronc — the parent company of the Capital Gazette — has established a families fund through the Community Foundation of Anne Arundel County. Anyone wishing to donate can call (410) 280-1102, go online to cfaac.org or send a check to CFAAC at 914 Bay Ridge Road, Suite 220, Annapolis, Maryland 21403 with “The Capital Gazette Families Fund” listed on the memo line. On June 28, five people were killed and two injured during a shooting at the Capital Gazette in Annapolis, Md. Journalists at the paper are reporting on the deaths of their own colleagues. Read about what the shooting was like for the survivors, written by Capital Gazette reporter Chase Cook. 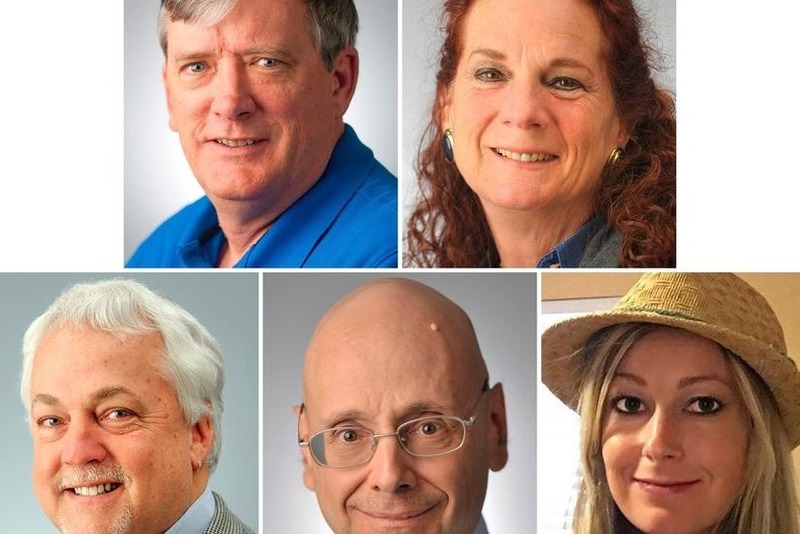 Please give what you can to help the Capital Gazette newsroom and their journalists. Our hearts break for our colleagues in Annapolis and we want to do whatever we possibly can to help them pay for medical bills, funeral costs, grief and trauma counseling, and any other unforeseen expenses that might arise as a result of this terrible shooting. Thank you all so much for the outpouring of love. The journalism community is truly a family. You can subscribe to the Capital Gazette here. We’ve raised $206,223 in 15 days to benefit the families and colleagues of the five Capital Gazette staffers killed on June 28. Donations ranging from $5 to $10,000 have poured in from an astounding 3,750 donors in all 50 states and 21 countries. Thank you for supporting journalism and the First Amendment. Thank you for supporting the families of those killed. And most importantly, thank you for valuing the work and lives of Gerald Fischman, Rob Hiaasen, John McNamara, Rebecca Smith and Wendi Winters. This campaign was born out of a Facebook group of journalists from around the world who within just a few hours of the shooting wanted to know how they could provide help and comfort to their colleagues. It was a collaborative effort in the truest sense of the phrase. With that said, I’ve now turned off donations for this GoFundMe but will leave the campaign page up for a while longer. The Capital Gazette Families Fund will continue to accept donations online, over the phone or through the mail. Tronc — the parent company of the Capital Gazette — established a families fund through the Community Foundation of Anne Arundel County. Anyone wishing to donate can call (410) 280-1102, go online to cfaac.org or send a check to CFAAC at 914 Bay Ridge Road, Suite 220, Annapolis, Maryland 21403 with “The Capital Gazette Families Fund” listed on the memo line. Thank you again for your generosity. Don't forget to subscribe to your local newspaper. I cannot fully express how grateful I am that so many of you have pitched in on this effort. We’ve received donations from all 50 states and 19 countries. The families and colleagues of the Capital Gazette staff will need an unimaginable amount of support — both emotional and financial — in the coming months. Our hearts ache for them, but it’s important for them that we channel our grief, fear and sadness into positive action. Now that the initial chaos has calmed a bit, tronc — the parent company of the Capital Gazette — has established a family fund through the Community Foundation of Anne Arundel County. Anyone wishing to donate can call (410) 280-1102, go online to cfaac.org or send a check to CFAAC at 914 Bay Ridge Road, Suite 220, Annapolis, Maryland 21403 with “The Capital Gazette Families Fund” listed on the memo line. Please note that while your donations through this GoFundMe are not tax-deductible, donations made directly to the fund are. Earlier this morning, I spoke with CFAAC finance director Taylor Milbradt about pooling our funds with those being managed by the foundation. I’ve designated CFAAC’s families fund as the sole official beneficiary of the GoFundMe, which means Taylor will be able to transfer money directly to the families fund from GoFundMe as donations continue to roll in. We’re also going to leave this GoFundMe page up for a while since the link has been shared widely. Through CFAAC, grants can be applied to grief and trauma counseling, medical expenses not covered by insurance, funeral expenses, and other associated expenses and services. We’ll keep you updated as funds start getting distributed to the families impacted by this senseless act of violence. If you haven’t yet, I highly encourage you to take a moment and read the obituaries of the Capital Gazette staffers who were killed. The lives of Gerald, Rob, John, Rebecca and Wendi will not be forgotten. There is a worldwide community of journalists determined to keep their spirits alive. Thank you again for the truly overwhelming amount of love and kindness. Don’t forget to subscribe to your local newspaper. Thank you for your overwhelming love and support. While we may not all work for the same news organization, journalism is a family and this senseless act of violence weighs heavy on all of our hearts. People in all 50 states and 14 countries have already offered their support and donations continue to pour in. As you may have already heard, five people were killed in the newsroom yesterday and two others were injured. Still, the courageous journalists put out a Friday edition of the newspaper. Please take a moment to read about the lives that were tragically cut short yesterday. Remember their names. Remember their faces. Subscribe to the Capital Gazette. Community journalism matters. Gerald Fischman, 61, was an editorial writer at The Capital for over 25 years. Fischman was remembered by his colleagues as someone who was the conscience and voice of the news organization. A former colleague said he had an “encyclopedia knowledge” of the world and another said he took care in every word he wrote. He is survived by his wife. Rob Hiaasen, 59, was an assistant editor and columnist at The Capital for eight years. Hiaasen had also previously worked at The Capital’s sister paper, The Baltimore Sun, for 17 years. Current and former colleagues described him as an “endearingly goofy storyteller,” drawn to quirky stories about people and community life. Hiaasen was a mentor to many young reporters, and had taught for the spring semester at the University of Maryland’s Philip Merrill College of Journalism. He is survived by his wife of 33 years, Maria, their three children, and three older siblings. John McNamara, 56, was a reporter and editor at The Capital for nearly 24 years. McNamara, who went by “Mac,” was remembered as a “jack of all trades” by a former colleague. He was also known for his “razor wit” and his extensive knowledge of regional sports. A friend and Baltimore Sun reporter described him as a “loyal friend with an infectious laugh.” He is survived by his wife, Andrea Chamblee. Rebecca Smith, 34, was a sales assistant at The Capital for seven months. Although Smith was a recent hire, her boss described her as thoughtful, kind and considerate. A friend said she had “the biggest heart” and that her fiance’s daughter from a previous relationship “idolized” Smith. She is survived by her fiancé and her fiancé’s daughter. Wendi Winters, 65, was an editor and reporter at The Capital who had written for the newsroom as a stringer for a decade before being hired on the staff in 2013. A former colleague said she had a talent for “connecting with the community,” and a current colleague said she loved storytelling. She was known among friends for her detailed Christmas letters that would chronicle her family’s life over the previous year. Winters is survived by her four children. Editor’s note: GoFundMe has suggested raising the goal every time we get close to hitting a new one, so as long as people are supporting this effort, it’ll continue to rise. As this is just getting started, there’s no concrete plan for what will happen to these funds yet. Families and loved ones will need some time to figure out they need most. Per a GoFundMe staff member: "Once things settle a bit, we will work together to formulate a clear plan for withdrawals and how the money will be handled. We can discuss those specific details in the coming days as we want to allow the Capital Gazette team a bit of time to settle, grieve, and remember the lives of their colleagues." In the meantime, neither myself nor anyone else is able to withdraw funds from GoFundMe.